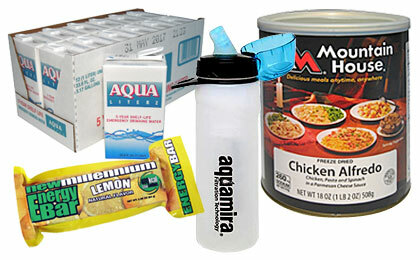 Prepare for natural and manmade disasters with emergency food and water and long term storage solutions. More than buying extra groceries these emergency food and water stores are prepared and packed specifically for storage long term. Extra canned goods and water is always a good idea, but our emergency food and water supplies will still be ready when your grocery store extras have spoiled or run out. Make sure you and your family have the basic necessities to survive any conditions that arise.